Dream It, Be It: Career Support for Girls helps girls grow up to be strong, successful, happy adults. Dream It, Be It targets girls in secondary school who face obstacles to their future success. It provides girls with access to professional role models, career education and the resources to live their dreams. Soroptimist clubs work in partnership with girls in small groups or a conference setting to provide them with the information and resources they want and need to be successful. The topics covered include career opportunities, setting and achieving goals, overcoming obstacles to success and how to move forward after setbacks or failures. This year's event is set for Saturday, April 14, 2018. 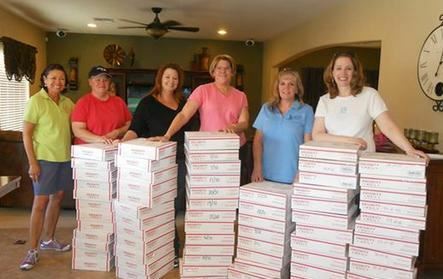 Since 2009, our club has been sending care packages to female military personnel overseas. It started with just 30 care packages and has increased to over 250 boxes! Boxes include "girlie" items such as full-sized conditioner, lotion, beauty products, magazines, books, and Girl Scout cookies as a way of showing the women who receive our care packages that we realize they miss the simple comforts of home while deployed overseas. We are grateful for the support of KTAR's Mac and Gaydosas and Visit Glendale for supporting Operation Women Warriors as well as Youth For Troops and the Arizona Girl Scouts.